Platinum PADI Course Director Melita has been diving since 1993 with over 5500 logged dives in Australia, Barbados, Cuba, Dominican Republic, Egypt, England, Fiji, Grenada, Israel, Jamaica, Maldives, Malta, Mexico, Thailand, Turkey and St Lucia and is still actively diving and teaching. 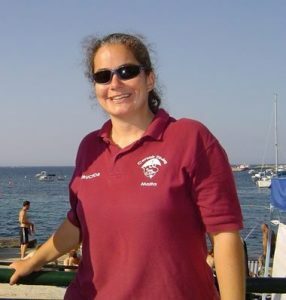 Melita is also an Instructor Trainer for more than 17 specialties, Emergency First Response Instructor trainer, having certified and team taught over 1000+ PADI certifications of all levels. With valuable experience, knowledge and the quality of instructors already trained, you can be assured of the very best quality education and introduction to the dive industry. Since graduating as a PADI Course Director, 100% IDC candidates trained by Melita have achieved a first IE passing rate! Melita has won the Malta Tourism Association STAR (Special Thanks And Recognition) award for sports instructor. This was voted on by tourists visiting Malta. Melita has also received recognition from PADI for excellence in professional level courses. 8 IDCs prior to IEs per year. IDCs can also be held at any time that is convenient for the student. Malta is an ideal location in which to do your IDC as it is less than a 3 hour flight from most of Europe, and the water temperatures varies between 28 and 15 degrees Centigrade. As long as I can remember I wanted to dive. The minimum age to join the local dive club was 16, I was far too young, at that time turning 16 seemed a lifetime away. Every year on holiday I would ask my parents if I could try diving as the minimum age was lower. Eventually my parents let me complete a try dive on holiday, it was everything I imagined it would be. I continued to dive on holiday, and completed several courses whilst at University. As graduation day was getting closer I decided I didn’t want the “proper” job yet, and decided to complete my Divemaster and Instructor and travel the world. I came to Malta in 2002 to work as an Instructor for the summer, and have been here ever since. After working as an Instructor at a few dive schools for six years, my partner and I decided to open our own school, and in February 2008, Divesmart Gozo opened its doors. Our school has gone from strength to strength, and around 50% of our customers have either been recommended, or are returning customers. Becoming a Dive Professional is a Life Changing Experience! Imagine a Job where you go to work in your shorts and bikinis? What is the philosophy of your Dive Centre? To offer friendly, yet professional services to students completing courses at all levels, and divers visiting the wonderful sites of Malta. The IDC is not just about passing the exam, it is about becoming fully prepared and confident to teach at the end of it. We always keep our groups small, and this includes the IDC. My partner is a Master Instructor, so he is always on hand to help with all aspects of the IDC, IE and specialties. 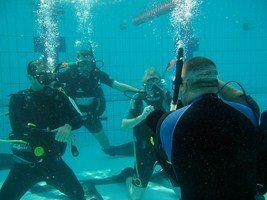 I still regularly teach all courses including Discover Scuba Diving. How can I teach Instructor candidates to teach all courses if I don’t teach them myself? Being resident in Malta I am able to teach an IDC or specialties at a time that is convenient for the student. They then have the option of completing the IE in Malta, or at a location of their choice. Although I have a Master Instructor, and Staff Instructors to assist during the course I am always available. During your IE in Malta you will be assisted from start to finish, making it easier for you to concentrate on the important things. We will take you to the exam room, pool, open water site, make sure you have everything you need to succeed, and even bring you lunch. I feel that Instructors should learn to teach the specialties through a Course Director, as it gives them a greater insight into the skills and abilities needed to teach their own students. For this reason I offer a package of up to 17 Instructor specialties after the IDC. During the specialties I try to go to all the best sites that Malta, Gozo and Comino have to offer. I have written a PADI distinctive specialty called the Resort Combined Skills Operative. 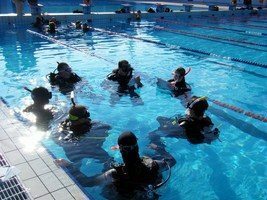 This is a one day course that includes everything you need to work in a resort environment as a PADI professional. 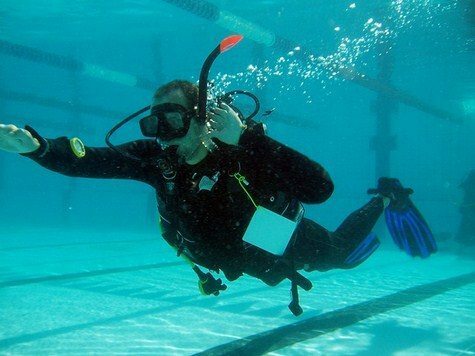 I teach compressor and bank use, basic equipment repair which is designed to be used at a dive site in order to save a dive, CV writing techniques and many more useful subjects. My dive centre is located in a busy tourist area. The accommodation is cheap, and the bars and restaurants plentiful so you don’t have very far to go to get a meal after a busy day on the IDC. My job doesn’t finish when you pass your IE, if you have any questions in the future I will be happy to help. sport. I hope that by being a female Course Director, I will bring more women into the diving industry. There is a lot of banter during the IDC. I hope this helps with alleviating some of the stress candidates put on themselves. Divesmart Gozo is a purpose built dive centre located on street level. We have a designated wet area to wash and store your equipment. The classroom is large, will keep you warm in the winter, and cool in the summer. A large TV connected to a laptop will let you view all the multimedia PADI has to offer. As the dive centre has a very nautical and pirate theme (the Corsairs were Mediterranean based pirates), the classroom has wooden flooring, cupboards and lovely large table. Tea, coffee, water and home made cakes are free and plentiful throughout the IDC. All confined and open water sessions during the IDC are held at the same location as the IE, so there will be no surprises on the big day. I enjoy all types of diving, but I do particularly like the wrecks around Malta. They are different types, ages and depths, and always have a lot of life on them. After working six or seven days a week there’s not much time for anything else. If I can, I do enjoy going to the beach. Being a Course Director enables me to pass on the knowledge I have gained over the last 10 years to new Instructors. I also love meeting people of all ages, cultures and nationalities who love diving, and are excited about their future as a diving instructor. What do her students think of Melita? Want to see what goes on during our IDC classes ?